Welcome to 2/90 Sign Systems!Slide System Support | Welcome to 2/90 Sign Systems! Choose from Thin, Standard or Box Rail structural styles. With the three structural rail elements available in the Slide Sign System, you can configure virtually any modular sign for unlimited creative flexibility. Because rail faces are identical, any insert can be used. End caps, accent strips, frames, top and bottom trims and insert options allow for infinite creative flexibility within a system that is elegantly simple. Color and form can say as much as words and graphics. 2/90 offers a broad range of aesthetic options that help you create an impression even as you’re delivering information and helping people navigate your building. Seventeen standard mounting options empower you to seamlessly integrate signs into any architectural environment. Tamper-resistant features ensure that your design vision will withstand the rigors of time. Size: Rails are 2”, 3” or 4” in height for Thin and Standard profiles; 6” high rails are also available for Standard profile. Standard profile rails are available in any width up to 90”; Thin profile rails are available in any width up to 40”. Configurations: Minimum height is 2” and can increase in 1” increments. Signs can be installed next to each other to create larger widths. 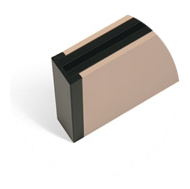 Slide Profiles: Specify Thin, Standard or Box rail. A popular choice for identification and regulatory signs. Recommended maximum insert is 400 square inches. A great option for larger directories, flag-mounted, and two-sided ceiling mounted signs. Recommended insert size is 400-2,000 square inches. Recommended insert size is 2,000-5,400 square inches. Select sign size and insert configuration. For example, a 2x6B sign has a total insert area of 2″ high by 6″ wide, with the letter B designating two- 1″x 6″ inserts. Overall sign dimensions including end caps, mount, and accessories, vary depending on options selected. Contact Client Services for exact dimensions. 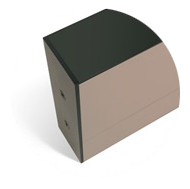 Choose an end cap design from seven styles of painted or satin aluminum finish. Secure copy inserts with seven end cap styles. Material: Aluminum for Standard and Thin styles; 2”, 3” and 4” Round Corner and 2” Slimline painted end caps are ABS plastic. Application: End caps secure inserts to rail. End caps are removable with an optional tamper-resistant locking feature. Style: Choose from seven styles with painted or satin aluminum finish. Satin aluminum finish not available for Round Corner. Choose from 100 standard materials: painted, laminate, paper or create your own. Slide Modular inserts “slide” onto the structural rail and are secured by end caps. *Exposed channels on Window Inserts are black. Additional colors available, including satin natural aluminum finish. Indicate your choice of graphics including ADA-compliant options and state-of-the-art Direct Print. Create one-of-a-kind graphics by selecting your application method, font, copy size, position, and case. Choose from nine copy options including our newest and most popular, Direct Print. For ADA compliancy, we offer three ADA copy options to fit a variety of insert materials and needs. Subsurface graphics are sealed with a laminate, producing raised images with rounded edges for a “soft touch” look and feel. Insert color is also subsurface. Laser print graphics are available on paper inserts and protected by a clear lens. Customer may order pre-printed paper inserts or print their own. Standard paper colors are available in popular insert sizes; other sizes may require longer lead times. For paper refills refer to page 7 for Slide and page 15 for Arc. Custom paper is available. Choose from over 17 mounting options for wall, cubical and ceiling installations. 2/90 Sign Systems offers 17 standard mounting options to meet a variety of installation applications for office furniture, vertical surfaces and ceilings. Illustrations below depict mount with the Standard Slide Modular Sign System; Thin Slide, Arc and Klik mounts may vary. Custom mounting options are available. Pressure-sensitive mounting is intended for smooth, hard surfaces. Not recommended for selected vinyl wall coverings. Can be used with Silastic® bonding. 100 square inches maximum. Same as “A” but uses magnetic mounting for steel surfaces. 100 square inches maximum. Same as “A” but uses Velcro® for fabric surfaces. 100 square inches maximum. Screw-on mounting for rough surfaces such as brick and drywall, where “A” is not recommended. Recommended on all wall-mounted signs larger than 100 square inches. A specifically designed pin device for fabric surfaces. Unique one-piece design enables mounting to any fabric surface, including fabrics mounted over hard materials. 100 square inches maximum. Clear plastic device “hooks over” top of panel. Automatically locates sign 2″ from top of panel. Order must specify panel make and thickness. 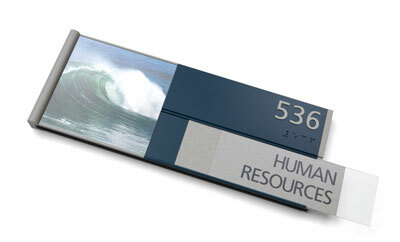 For free-standing applications such as receptionist name signs. Extruded or machined aluminum or acrylic bracket. Fabricated for 1 or 2 sided applications up to 12″ in height. One-sided version sits at 30° angle with non-slip bumpers. For mounting on top surface of panel. Extruded or machined aluminum or acrylic bracket with pressure-sensitive tape. Fabricated for 1 or 2 sided applications up to 12″ in height. One-sided version sits at 30° angle. Connects to grid system using 2″ extruded aluminum brackets. Signs appear to be “floating” below ceiling line. Specify 1/2″ or 1″ grid system. General-purpose hanging applications for high or irregular ceilings. Hang lines tie to various points (rafters, beams, duct work, piping, etc.). Customer must supply hang line material. Mounts sign at 90° angle to wall surface. Not available on signs wider than 15″. Clear acrylic bracket attached to glass with clear pressure-sensitive tape. Extruded aluminum bracket designed for screw mount. No mounting screws provided. Sign mounts 6″, 12″, 18″ or 24″ from ceiling using 1/2″ black aluminum rod. Under the top cap panel device in black or white fabric. Automatically locates the sign flush with the top of the panel. Order must specify fabric color. Aluminum device hooks over the top of panel, under the top cap. Automatically locates sign flush with the top of the panel. Order must specify panel make and thickness. Aluminum device hooks over the top of panel top. Locates sign flush with panel top. Can be one or two sided. Dress up your sign with accessories. Add contrast to your design with Top/Bottom Trim and Accent Strips. Available painted and Satin Natural Aluminum finish. Signs with dry erase material can benefit from adding a Pen Holder to house the elusive dry erase marker. Pen holder is mill finished aluminum, painted black. Other colors are available. SmartStrips™ hold messages securely, providing a flexible solution for temporary room identification, notifications, or an in-box. To remove the message, simply lift it up and slide to side. SmartStrips™ are available as an integral part of the sign or sold separately. When purchased separately, they can be installed next to a sign or used alone to hold messages or postings. SmartStrip™ accepts laminated messages. Available in Satin Natural Aluminum finish with black caps. 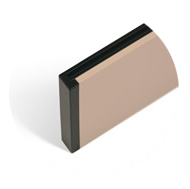 For window inserts with paper that need to change often, we recommend the notched-end cap. The paper and protective lens slide off easily without removing the end cap. This feature is available with Slimline end cap style in satin natural aluminum finish or painted colors.